As I mentioned before, this past Friday was Rusty's birthday. Since we were visiting the program where he works as a therapy dog, I proposed having a little celebration that the staff was all for. We pulled it off and had a fun party for 1 dog, 22 children, and 4 staffers. What does it take to do this? Cupcakes for the humans. Much to the chagrin of certain friends, I was not about to bake for that many people. I ended up getting them at Ralph's, a local grocery store, and they were quite tasty. 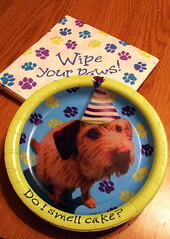 Cute doggie themed plates, napkins, tablecloth, and party hats. I didn't get a photo of the hats and tablecloth. Party America came through for me with an entire selection of dog themed party supplies. That store has been good to us lately. 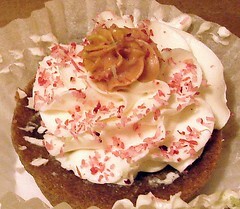 A pupcake for Rusty from the Three Dog Bakery. 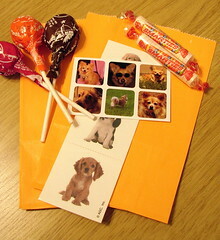 Goody bags for the kids, with stickers, tattoos, and candy. 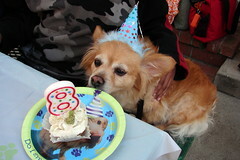 A #8 candle and doggie party hat. Rolling in the grass and belly rubs from some of the kids. That is priceless! I love it! Those plates are the best! Doggie party hat? LOVE. So freaking cute. You are the best dog mama EVER! What program does he work as a therapy dog for? 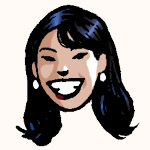 How did you guys get involve in it? Wow ... he got more spoilt than me ... but I'm glad he is a March baby like me. 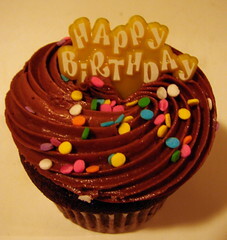 Happy belated birthday Rusty. That looked a cool party.